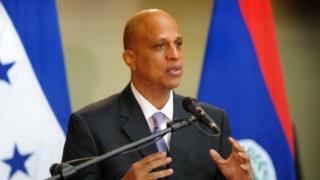 Belize's Prime Minister Dean Barrow has won an unprecedented third consecutive term in office in snap elections in the small Central American nation. Mr Barrrow, 64, called the election in September, more than a year ahead of schedule. Belize is heavily dependent on aid from Venezuela, which also offers it oil at discounted prices. Critics of Mr Barrow said he brought the polls forward in case Venezuela cuts its funding. Venezuela is holding legislative elections on 6 December and some polls predict the governing socialist party will lose control of the National Assembly. Many of the recipients of Venezuelan aid fear that with continuing low oil prices Venezuela will soon significantly reduce its contributions to its allies. Mr Barrow has invested much of the $150m (£98m) Belize received from Venezuela in the past years in an ambitious infrastructure programme and road building. With results announced in all but two of the constituencies, Mr Barrow's party won in 19 and the opposition People's United Party in 10. Mr Barrow called it "a magnificent victory". His main rival, Francis Fonseca, had run on a promise of creating 25,000 jobs and cutting living costs. Mr Barrow will now have to grapple with its much larger neighbour, Guatemala. Guatemala's newly elected president, comedian-turned-politician Jimmy Morales, in his campaign said he would pursue with renewed vigour his country's claims over more than half of Belize.